The Trust now has it's own page on Facebook. Visit us here to keep track of the latest news. "BW are pleased to advise that works to the third party wall are now underway. The developers anticipate these works will be completed within three weeks; further updates will be issued in due course." Over the weekend of 13th and 14th November, a total of 24 volunteers (18 on the Saturday and 16 on the Sunday) spent a day or two of their time working at Froghall Basin. The Trust has an exhibition at Froghall & Kingsley Station on the Churnet Valley railway as part of the gala event to celebrate the re-opening of the line from Leekbrook junction to Cauldon Lowe. 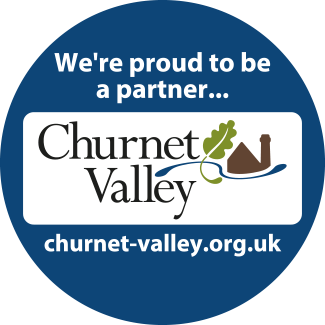 We have displays about the Uttoxeter Canal restoration, Leek Branch extension and Churnet Valley Living Landscape Partnership, and will be on site to talk to you about these exciting projects on selected days. Visit Canal Cruising Co on Saturday 2 October - the boatyard at the heart of canal town Stone – and explore taking a holiday afloat, life on board a working narrow boat and restoring the lost canals of Staffordshire with volunteers from The Inland Waterways Association (IWA) Stoke-on-Trent branch and Caldon & Uttoxeter Canals Trust. After £500,000 of investment and almost eight months of investigations, plans and repairs, British Waterways has announced that the Caldon Canal is now open following a breach in November. Redhills Road was closed to road traffic after an accident on Saturday 5th June left the bridge badly damaged. Heritage Lottery Fund has earmarked £17m to help communities look after their landscapes - including the Staffordshire Moorlands landscape embracing the Caldon and Uttoxeter Canals. Read more about Loving our Landscape!